Storytiming while pregnant, tips and tricks! When/if to tell your storytime regulars: Personally, I did not tell my program regulars until I was asked, which was after I was noticably showing. For me this was well into my pregnancy (around the middle of month seven). I am tall and so I flew under the radar for quite awhile, despite feeling as though I was going to throw up on kids and parents during storytime. Movement during storytime: Normally I LOVE to be super active during my storytimes and programs but, with a baby pushing on my bladder and making my backache, this wasn't always possible. So, have a comfy chair, have an exit plan for the bathroom/puke emergencies, and during jumping songs, just bounce. I would often ask my groups to "show me how good you can jump!" so I wouldn't have to full out demonstrate it myself. My preparation for maternity leave. 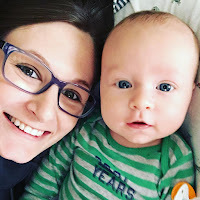 I want to talk about how I planned for my maternity leave this past summer because when I searched the internet I couldn't find anything that pertained to maternity leave for a job like my own. What specific duties am I in charge of? What programs will happen during my leave? What do I have soon after I return? At my library we each choose 5 or 6 weeks during the year to plan a themed storytime for that week. This made it slightly easier on me since I did not have to prep 12 weeks worth of storytimes before I left. I only had to prepare two weeks. Every Wednesday I run a preschool program, this program was handed off to one of my coworkers. I made her a basic outline of how I run the program and gave her my detailed planning sheets so she could have a structure when I was gone. One of my coworkers and I both plan school age programs once or twice a month. During my leave I did not have any school age programs planned. Although, we did hold an I Survived program the Thursday before my little guy was born. In addition to my program duties I also am a school liasion for our local elementary schools and I am in charge of our early reading collection. During my absence my manager spread these duties around so they were equally balanced between my coworkers. I am so very lucky to have an amazing manager and coworkers who jumped in to cover during my absence, now that I'm back I jumped right off where I left everything, my planning paid off! This means I can leave work and go home and relax with my little guy stress free.